I can't seem to access the site from this computer...just testing. This morning I poured ground coffee into the water reservoir in the coffee maker, proving once again that I should not make a pot of coffee before I have had a cup of coffee. Resolution: Figure out how to use the built in timer; wake to the smell of hot coffee. Inspired by Mrs. T., and stuck with leftover pancakes, I decided to try using the flat quick breads as a base for a pudding...it worked out quite nicely, though I just added egg, cream, sugar and cinnamon (what, no syrup? noooo. I forgot we had a gallon of the stuff to use--typical me). But here's the problem: We have the leftover pancakes because someone gave up pancakes for Lent. Can that someone eat the modified pancakes and still maintain the Lenten discipline? Hmm? Following Al Roker's last choice for his Book Club for Kids, the propaganda piece Change Has Come, I see that the Mysterious Benedict Society is the new group read. I wonder if the young book club members will see the connection between "change" due to the "crisis," and the manufactured "emergency" and control of the media that requires our young heros to turn of the TV and remain clear-headed in MBS. Just finished Real Education by Charles Murray, who also wrote the controversial Bell Curve. The book is written around 4 premises: Children have different abilities; half of children are below average; everyone does not need to go to college; the future of America depends on how we educate the gifted. Addressing the secular masses, Murray makes a case for a liberal arts education before college, insists that we need more cultural literacy (something the current president could use, whether he is campaigning in all "57 states," giving a speech in Ford's theater or speaking before both houses of congress), and discusses education in terms of Gardner's multiple intelligences at length. And he seems to say that homeschoolers may have an advantage in that we seem to already know and use his suggestions, finding alternatives to college and encouraging our children in a way that acknowledges and nurtures their strengths. Half the children are still below average. No matter what you do, unless, of course, all children are identical and there is none achieving more or less than any other. Everyone does not need to go to college. He makes a great case for skilled labor careers. On educating the gifted: This is an interesting part of the book, and one I'm still thinking about. How do we educate the gifted, and why does it matter for the future of the country? This soon to be timeless game includes such memorable Obama phrases like "let me be clear", "vulnerable Americans", and who can forget the classic "toxic assets". Makes me wish we watched TV. What? Kids Need to Play? 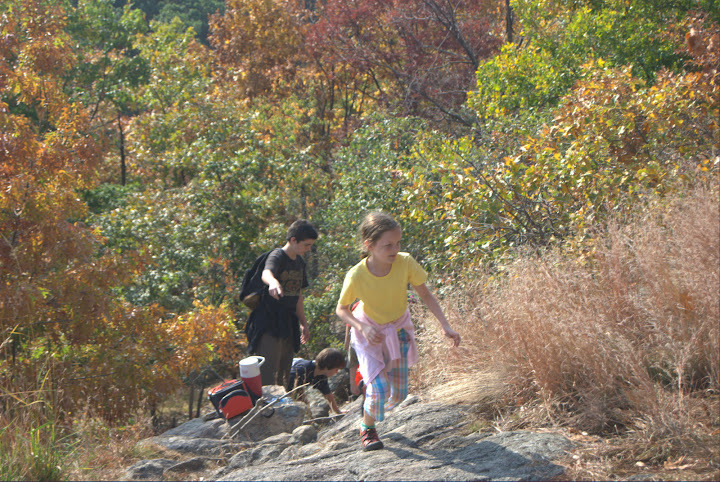 other research suggests that all children, not just those with attention problems, can benefit from spending time in nature during the school day. In another study of children who live in public housing, girls who had access to green courtyards scored better on concentration tests than those who did not." Why is this a surprise to anyone? Have the folks in charge of schools never observed children? Again, this is not a political blog. My motto is: "Someone else can say it better." Still, hearing this montage of Obama's overuse of the word "crisis" reminds me of the manufactured "emergency" in The Mysterious Benedict Society. If only a group of child-super-geniuses were available to rescue us from the "crisis" we could all relax. I Got My New Lens!! 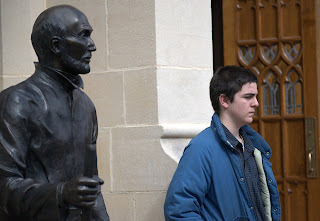 Trip thinks about his spiritual future during a campus tour. It broke. Really, and it was not my fault. One minute it was working fine, and the next the radio transmitter had died. I suppose it would have worked with an Ethernet cable...but it's a laptop, and I want to use it in a variety of places, right? So we returned it, and got this Toshiba Satellite instead. Give me a week or two, and I'll let you know how sturdy it is. So far as first impressions, it has my favorite touch-pad mouse ever. It's fast, and while a bit heavier than my original choice (Asus), it's not too heavy to drag around. So maybe I can catch up on correspondence soon. If you are waiting for something from me, now is the time to send me a nag note. 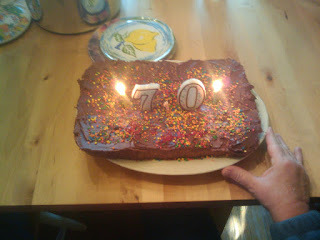 Paul Baked a Cake For Grannie! My mum (standing, far right) is having a significant birthday today--I won't tell you how significant, but it's a big one! After consulting my friend Chris, who sent me this lovely recipe and article from the NY Times, I decided to try my hand at making sourdough. She did not send me a sourdough recipe, but she encouraged me when I told her my greatest fear: Something toxic might grow in the starter. "You know too much," she chided. And I put my thoughts of menacing mycelium out of my mind and made a sourdough starter. It's in a jar labeled Patak, an Indian ready-made sauce company, but since Pa Tak is also a Klingon swear-word, I have kept the name, and that's what I call my starter. If you ever want a sample of my starter, just ask for PaTak. Yes, well, last night, when I decided to use the starter and make bread, I was thrilled that I could smell what I thought was a truly sourdoughesque smell. It turned out to be Paul's socks. Ugh. The starter itself did not have a very strong sour smell at all, but, after rising overnight, the bread does have that distinctive odor. I can't wait to sample it. Breakfast bar, keeping the white-and-stainless theme, is on the other side of the room...I guess it's not quite done yet...this photo was taken before all the chairs were purchased, and a tall steel book shelf, replacing the short-but-too-wide one seen here) is now on the right, but missing from the photo. Poor Avogadro (plant, left), stuck behind boxes in a spare room during all the construction, is struggling to come back from yet another accidental drought. I predict a complete recovery. The last detail (for now): A photo triptych of pub scenes, featuring my brothers, Trip, and me, in what some folks have called my natural environment (thanks, Mel, for the framed photos!). Note the lighting effect, courtesy of the flexible track lighting that Wireman installed. And boy, when you are working with large appliances, wearing an argyle pullover is so much nicer looking than a sensible t-shirt or coverall. Right? Later, Wireman was seen (sans pullover) attaching a counter-top to a cabinet...is there anything Wireman can't do? and wanted to avoid going to a school dance (just not your thing), would you hide in an abandoned refrigerator? And I have a lovely new laptop. That works. Yay. Now if only I had my old files...soon! (on a borrowed computer, that has its own problems...like no cooling fan, so this is not a permanent solution). As mothers we want what's best for our children, but this story about the baby without the gene for breast cancer has been nagging at me. This mother, in an effort to save her child (and future generations) from a particular affliction, chose to have a cancer-free embryo selected in vitro, rather than risk the possibility of conceiving a child who might have the gene, and thus develop this cancer. Putting aside the obvious ethical issues involved in this sort of procedure, isn't there a familiar ring to this story? Haven't we heard stories about mothers trying to protect their children from harm by extraordinary means, and doesn't it always go terribly wrong? Consider Thetis, a nymph from Greek mythology and mother of epic hero Achilles, who dips her young son in the River Styx to render him immortal. Scholars of mythology will recall that Thetis holds young Achilles by the heel, so only through his heel can he be mortally wounded. And so he is. Those who enjoy Norse myths will recall a similar tale, that of Baldur the Beautiful, whose mother Frigg, goddess of motherhood and fertility, extracts an oath from every thing on earth--living and inanimate--to bring no harm to her son. But Frigg overlooks the small mistletoe, and by mistletoe is Baldur's death accomplished. A more recent tale is that of the Sleeping Beauty, whose parents believe they can prevent harm coming to their daughter by selecting their christening guests with care. Of course, the uninvited guest shows up to curse the baby, and we know the rest of the story. Yes, these are all myths, but each myth tells us something about ourselves. All mothers want to keep their children from harm, and most will go to extraordinary measures to keep their children safe. But we cannot save them from everything, all the time; if we try, we are frustrated again and again. Someday, each child will have to face tragedy and death; that is part of our human existence. The question is, how far should we go? We do not encourage our children to engage in dangerous activities, but should we be tinkering with their genes? No doubt, breast cancer is tragic. I lost a friend to an aggressive form of that cancer. She left behind a husband, two young daughters, a sister and her parents. There was no history of breast cancer in her family. It happened anyway. The genetically selected baby may also suffer in ways that her parents can neither predict nor prevent. We all hope that she thrives, but no one can promise anything. Labels: Catholicism, One More Thing, Science, Seen it all yet?